If you are anything like me you are forever writing down notes for things that you need to pick up or add to your to-do list. I made myself this cute little note holder and change my notes each month. November brings Thanksgiving and a full month of giving thanks every day for things in our life so my note papers reflect that. 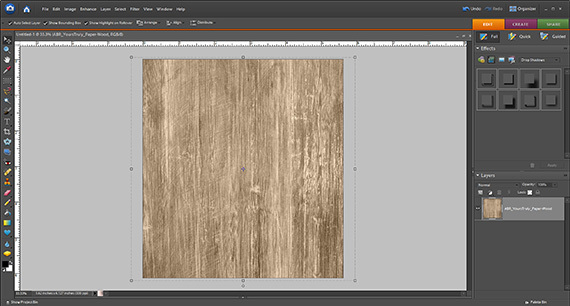 Step 1: Create a new blank document in your photo editing software measuring 5 5/8 x 6 1/8 inches. Drag in your choice of digital scrapbooking paper/papers. 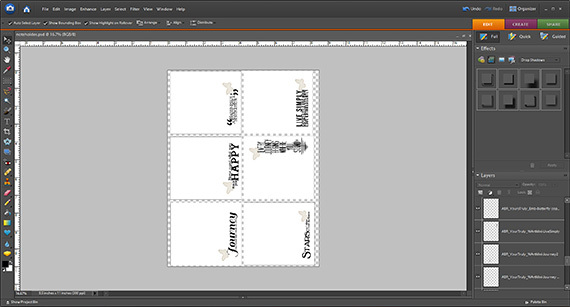 You are going to be printing on both sides of the cardstock for your box base. 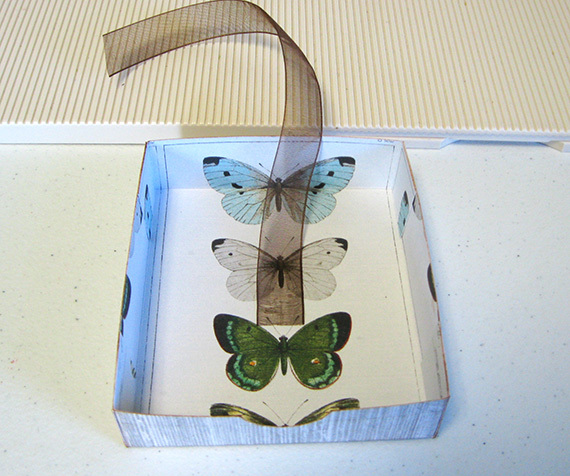 I chose the wood grained paper for the outside and the butterfly paper for the inside. Print, set aside and close this document. 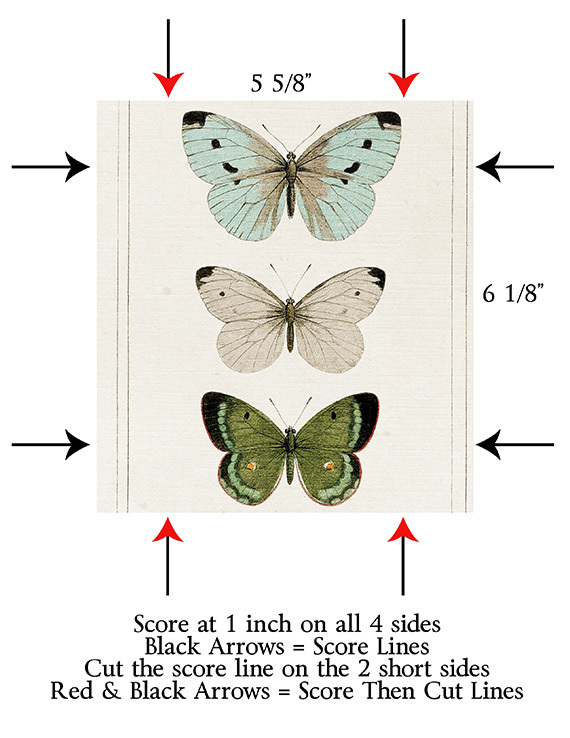 Step 2: Create a new blank document in your photo editing software measuring 8 ½ by 11 inches. 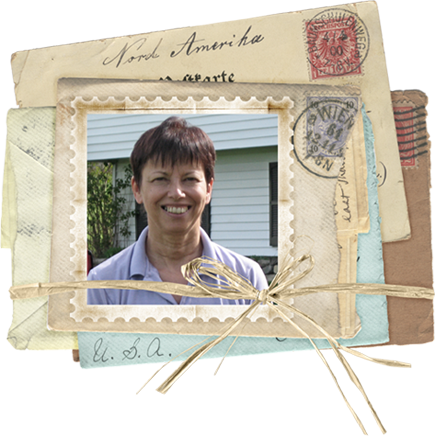 Create 6 – 3 ½ x 4 inch rectangles (I add a minimal stroke outline so that I will be able to see where to cut my rectangles). Add any embellishments, word-art, quotes, etc. that you want for your note papers. Print on regular copy paper, cut, round the corners (optional) and set aside. Step 3: Take your printed cardstock, cut at 5 5/8 x 6 1/8. Score at 1 inch on all 4 sides. Fold on the score lines. On the 5 5/8 inch sides – cut along your score line; just up until the point where it intersects with the next score line, creating tabs. Do this for all the score lines on the 5 5/8 inch side. ***Optional Step – At this point if you want to be able to get your paper out easier take a 1 inch hole punch and punch a hole in the center of one of the short sides. Distress if you wish. Step 4: Add score tape to the outside of the four tabs. 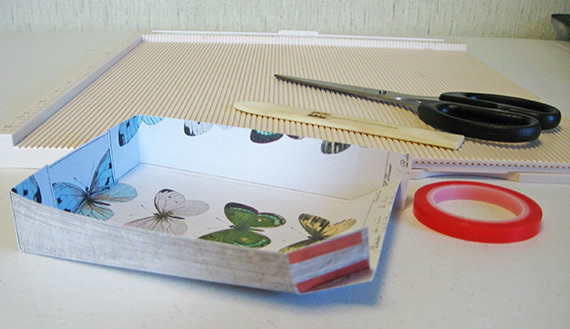 Peel off the backing from the scor tape and adhere to form the box/base of the note holder. 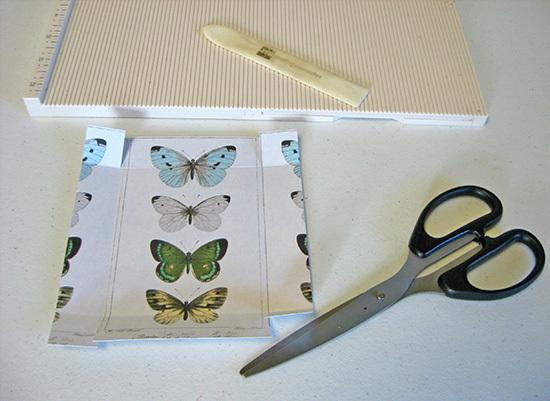 Step 5: ***Optional Step – Cut a piece of ribbon approximately 6 inches long. 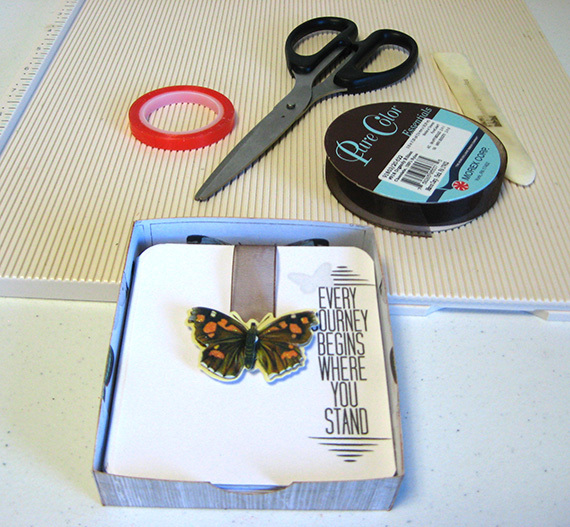 Place a glue dot on the underside of the ribbon and adhere to the bottom of the box. Decorate the other end of the ribbon with a button or another decorative embellishment (I used a chipboard butterfly from K & Company). Place your paper into the box and you are finished. 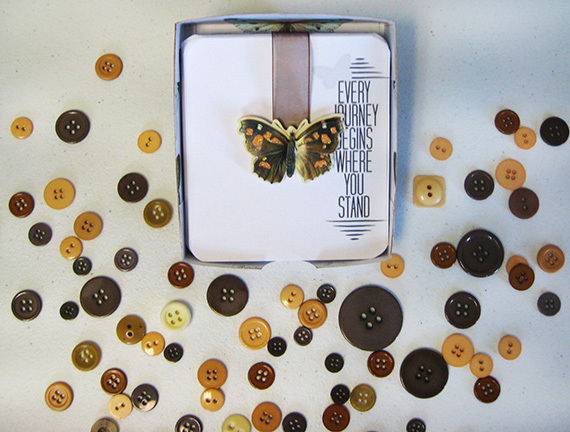 I hope you enjoyed this tutorial and will give this desktop note holder set a try. Please share your projects in the Scrap Girls Hybrid Gallery.